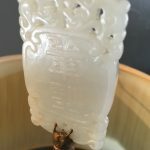 18th/19th c, 31.5″ h, white porcelain, jade finial carved with auspicious symbols. 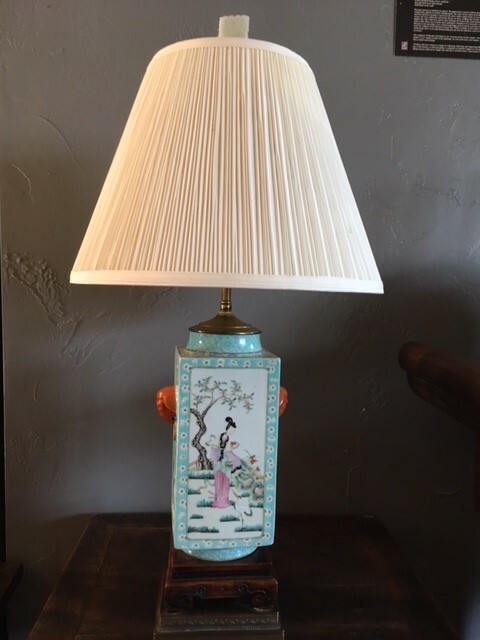 This vase/lamp is valuable for the vase’s quality, its fine enamel paintings, its carved white jade cap, and the unusual way it was converted into a lamp in China in the 1800s. Chinese porcelain was the rave of Europe at that time and influenced the foreign community in China to take interest in collecting beautiful porcelain vases. A quadrangle-shape piece is much harder to make than a round one as the four corners can easily break during firing. With official figures decorating it, it was most likely a piece made for a member of the elite class. Each of the four rectangular white porcelain glazed panel shows painting of a high official alternating with that of a court lady, richly dressed in famille-rose colors robe, relaxing and enjoying the outdoors under colorful floating clouds, in a garden setting. The mouth of the vase has a brocade-pattern frieze interrupted at opposite sides by a floriated design. The top of the quadrangle has a bat design at each corner, with cloud design floating around. The vase has a pair of orange color handles in the shape of a fu-dog head biting a ring. All these designs signify good fortune and happiness. 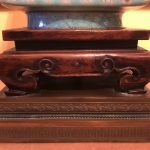 The vase sits on a Chinese archaic style carved wood base, which in turn is mounted on a heavy European style bronze incised socket pedestal so there is no possibility the lamp would topple. 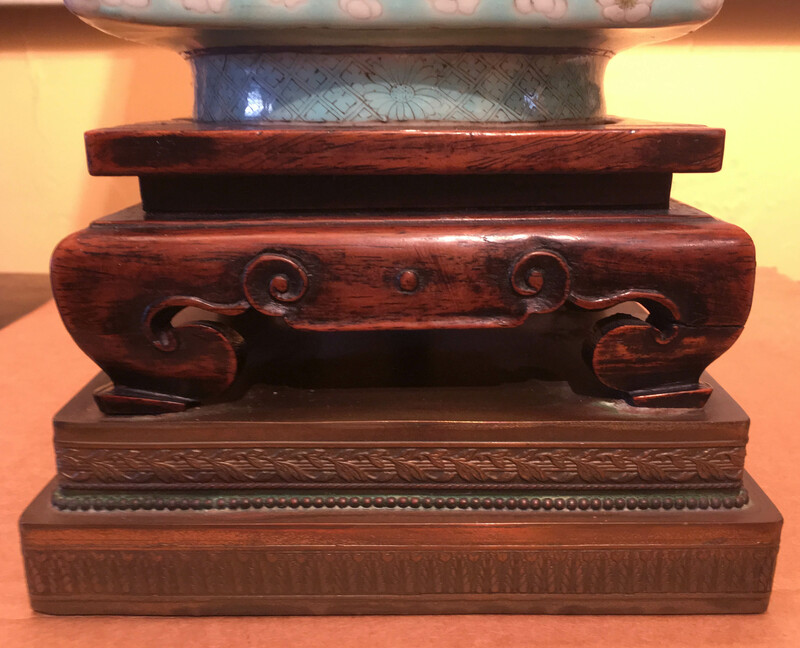 The antique metal lamp post is capped by a big white jade plaque with relief carvings of “double happiness”, “long life”, and “good fortune” Chinese characters, which makes it likely this piece was given as a wedding or birthday present to someone of importance. It was a treasured piece then and should be treasured today as a beautiful piece of art, a collector’s item. The shade is not original.